To celebrate Mardi Gras this year, I couldn’t resist pulling My New Orleans off the shelf, and my first thought was to try the crawfish etouffee. Unfortunately, it’s not quite crawfish season yet. Sure, I could have purchased frozen crawfish tale meat, but then I would have no shells for making a shellfish stock which is essential to the dish. I decided to use Gulf shrimp and a couple of small lobster tails. As I started looking over the recipe, it occurred to me that I’ve never heard a good explanation of the difference between etouffee and gumbo. Both start with a roux, both involve the trinity of vegetables and stock, and both are usually served with rice. After some searching, the best explanation I found was that etouffee is almost always made with seafood and usually just one type at a time (clearly I cheated) while gumbo may contain seafood, meat, poultry, or a mix of any or all of the above. 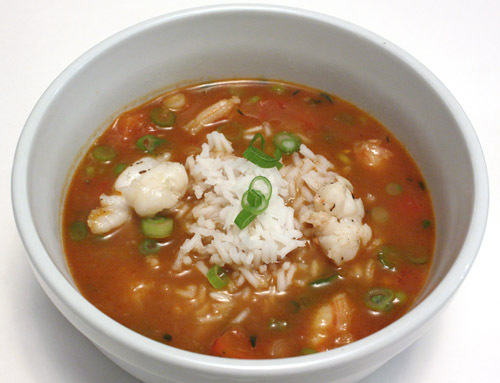 The word etouffee means smothered and the word gumbo is derived from an African word for okra, but both are stews. In the book, the crawfish etouffee recipe is regarded as the master recipe in which shrimp or crab can be substituted for the crawfish both in the finished dish and in the stock used to make it. The first step is to make the shellfish stock which is very easy and requires relatively little simmering time. Browned vegetables, shrimp and lobster shells, and water simmered for about an hour, but I’ve also made shellfish stock in closer to 30 minutes. Once the stock is finished, strained, and ready to be used, the etouffee was started, of course, with a roux. The goal is to cook the roux until it's the color of milk chocolate. Mine was just a little lighter than that, but I really didn’t want it to burn. Then, chopped onion was added and allowed to caramelize before the diced celery, red bell pepper, garlic, thyme, cayenne, extra cayenne in my case, and smoked paprika were added. I thought it was interesting that Besh suggested red bell pepper rather than green. Next, a peeled, seeded, and diced tomato was added with the shellfish stock. 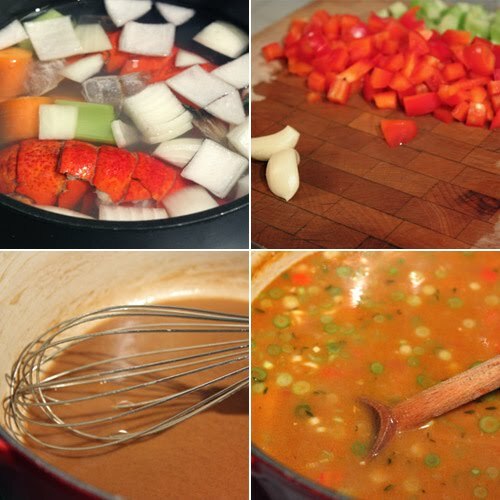 The mixture simmered for just seven minutes before sliced green onions and the shrimp and lobster meat were added. Last, butter was added, and it was seasoned with Worcestershire and Tabasco and checked for salt and pepper. When the shrimp were cooked through, it was served with white rice. Whether etouffee or gumbo or crawfish or shrimp, I really love this style of food and the flavors that develop as it simmers away. In this particular version, I appreciated the hint of smoke from the paprika. This one seemed a little less overly rich than some etouffees I’ve had. It wasn’t too heavy or too thick. The mix of shrimp and lobster was nice, but it was all about the flavor of the stew. I wish I could have one large bowl of them! Delish! Stunning! This is a great dish. Wonderful tips. I never take the time to make a shellfish stock and I should! this is a very nicely executed batch o' etouffee, lisa--bravo. I love cajun stews...gumbo, jambalaya, etouffee...I haven't really figured out the difference between all of them either. But what's in a name? What a delicious looking dish! 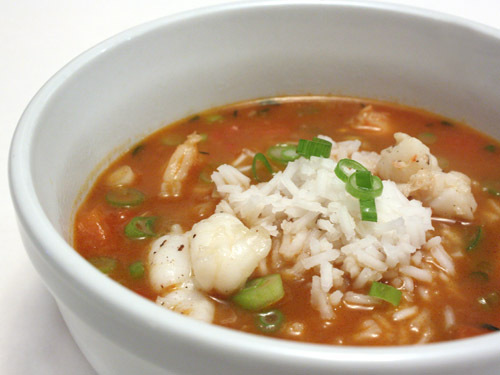 I have always wanted to try making gumbo, it looks so delicious! This was a lovely celebration indeed! Mmmmm - there is nothing quite like a good etouffee. Your version sounds amazing and the perfect way to show solidarity for Mardi Gras. shrimp and lobster - my fave seafood. what a luxurious bowl of soup! Delicious! I would love to try this. There's nothing better than etouffee! And you have a wonderful recipe. I like crawfish too, but your substitutions turned out perfectly. What kind of paprika did you use? John Besh is fabulous. One of the great chefs in NOLA. I was so disappointed when he didn't become an Iron Chef...although it certainly won't affect his career. He would have become more well known though. Barbara: I used a hot smoked Spanish paprika. I think I would enjoy that paprika is just about any savory dish! Etouffee is one of my top favorite regional American dishes. I love it, love it, love it. I don't know why I have never learned to make it before. Well, that's about to change. I have this book too - and absolutely love it. It's one of the most beautiful cookbooks I've ever seen. Your etouffee looks excellent! I can't wait to make it for myself. A totally fabulous etouffee, awesome with lobster! Oooh, I've been eye-ing this recipe in Besh's book, too. Looks even more awesome in your photos. I can almost taste the deep, complex flavors already. wow. everything you do is so fab! I too am a big Chef Besh groupie. Your food looks fabulous too! I've never had etouffee, it looks delicious! I'm imagining the wonderful briny seafood flavors infused in the tomato base. Wonderful! What courage. I've made shrimp creole from scratch but it's been 10 years since then and each time I crave something like it - or like this wonderful étoufée - I freak out about making the stock. You have just inspired me! And yum - lobster! This looks amazing! So comforting. I managed to miss all the awesomeness of Mardi Gras and NOLa's finest dishes! Thank goodness there's no expiration date on something as delicious as this. It's been ages since I've had étouffé, so it's about time I tried it again. This is a really old blog post, but in case you're still wondering about the difference, the roux for etouffe is far lighter and incorporates butter. The roux for gumbo is much darker and has only oil - no butter. Also, you're right: etouffe should be made with only one kind of seafood.